The cuckoos were named for the familiar calls of the Common Cuckoo, which are often used in cuckoo clocks. The majority of species occur in the tropics. Those found in temperate species are migratory, moving south for the winter. Most species live in forests, although some prefer more open habitats. The cuckoos have generally slender bodies and are of variable size. They have long tails and strong legs. Cuckoos are known for being brood parasites - although not all species are. Some cuckoos species do lay their eggs in the nests of other species, often choosing nests with eggs that closely resemble their own. Often, the cuckoo egg hatches earlier than the host's chicks, and the larger cuckoo chick will usually either evict the eggs or young of their host parents. The majority of species, however, raise their own young. For example, most of the American cuckoos, roadrunners, anis and coucals all build their own nests. Interestingly, non-parasitic cuckos, lay white eggs; while those that are parasitic, lay colors that mach those of their hosts. They usually nest in trees or bushes; although the coucals lay their eggs in nests on the ground or in low shrubs. 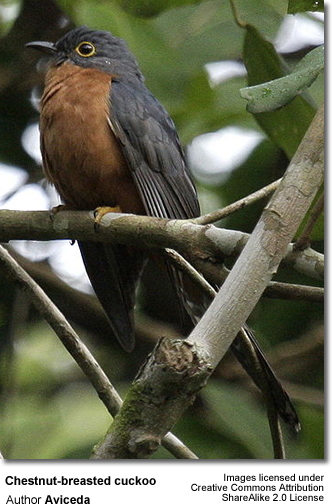 Most cuckoos feed on larger insects, caterpillars and other animal prey. 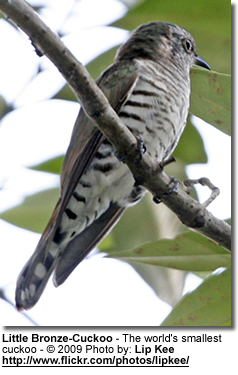 The lizard-cuckoos found in the Caribbean have specialized in taking lizards. 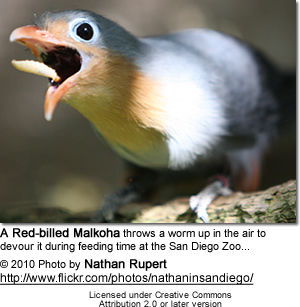 The larger species may also take snakes, small rodents, and even other birds, which they kill with their strong bills. 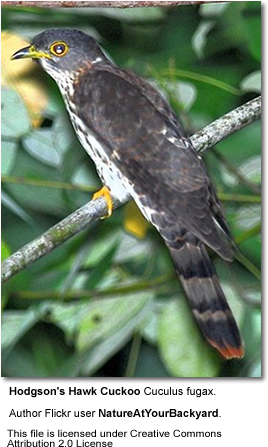 Some species - namely several koels, couas and the Channel-billed Cuckoo - feed mainly on fruit, but not exclusively so. Those raised by fruigivore hosts, such as the Figbird and Pied Currawong., will often consume mainly fruit. The familiar call of the Common Cuckoo is often used in cuckoo clocks. 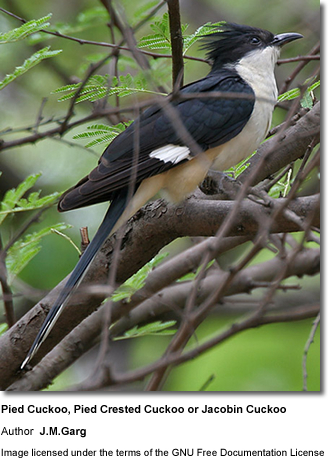 Genus Rhamphomantis - Long-billed Cuckoo: The Long-billed Cuckoo is monotypic (a genus consisting of only one species) within the genus Rhamphomantis. It is found in Indonesia and Papua New Guinea. Genus Cursoricoccyx - fossil (Early Miocene of Logan County, USA) - Neomorphinae?